Background/aim: Vitamin B12 plays an important role in the development of mental, motor, cognitive, and social functions via its role in DNA synthesis and nerve myelination. Its deficiency in infants might cause neuromotor retardation as well as megaloblastic anemia. The objective of this study was to investigate the effects of infantile vitamin B12 deficiency on evoked brain potentials and determine whether improvement could be obtained with vitamin B12 replacement at appropriate dosages. Materials and methods: Thirty patients with vitamin B12 deficiency and 30 age-matched healthy controls were included in the study. Hematological parameters, visual evoked potentials, and brainstem auditory evoked potentials tests were performed prior to treatment, 1 week after treatment, and 3 months after treatment. Results: Visual evoked potentials (VEPs) and brainstem auditory evoked potentials (BAEPs) were found to be prolonged in 16 (53.3%) and 15 (50%) patients, respectively. Statistically significant improvements in VEP and BAEP examinations were determined 3 months after treatment. Three months after treatment, VEP and BAEP examinations returned to normal in 81.3% and 53.3% of subjects with prolonged VEPs and BAEPs, respectively. Conclusion: These results demonstrate that vitamin B12 deficiency in infants causes significant impairment in the auditory and visual functioning tests of the brain, such as VEP and BAEP. Demir N, Koc A, Üstyol L, Peker E, Abuhandan M. Clinical and neurological findings of severe vitamin B12 deficiency in infancy and importance of early diagnosis and treatment. J Paediatr Child H 2013; 49: 820–824. Korenke GC, Hunneman DH, Eber S, Hanefeld F. Severe encephalopathy with epilepsy in an infant caused by subclinical maternal pernicious anaemia: case report and review of the literature. Eur J Pediatr 2004; 163: 196–201. Fine EJ, Soria E, Paroski MW, Petryk D, Thomasula L. The neurophysiological profile of vitamin B12 deficiency. Muscle Nerve 1990; 13: 158–164. Evim MS, Erdöl Ş, Özdemir Ö, Baytan B, Güneş AM. Long-term outcome in children with nutritional vitamin B12 deficiency. Turk J Hematol 2011; 28: 286–293. Von Schenck U, Bender-Götze C, Koletzko B. Persistence of neurological damage induced by dietary vitamin B12 deficiency in infancy. Arch Dis Child 1997; 77: 137–139. Biancheri R, Cerone R, Schiaffino MC, Caruso U, Veneselli E, Perrone MV, Rossi A, Gatti R. Cobalamin (Cbl) C/D deficiency: clinical, neurophysiological and neuroradiologic findings in 14 cases. Neuropediatrics 2001; 32: 14–22. Avci Z, Turull T, Aysun S, Unal I. Involuntary movements and magnetic resonance imaging findings in infantile cobalamine (vitamin B12) deficiency. Pediatrics 2003; 112: 684–686. Watkins D, Whitehead VM, Rosenblatt DS. Megaloblastic anemia. In: Orkin SH, Fisher DE, Look AT, Lux SE, Ginsburg D, Nathan DG, editors. Hematology of Infancy and Childhood. 7th ed. Philadelphia, PA, USA: Saunders Elsevier; 2009. pp. 469–521. Ahmed A, Kothari MJ. Recovery of neurologic dysfunction with early intervention of vitamin B12. J Clin Neuromuscul Dis 2010; 11: 198–202. Neyzi O. Büyüme ve Gelişme. In: Neyzi O, Ertuğrul T, editors. Pediatri. 3rd ed. Istanbul, Turkey: Nobel Tıp Kitapevi; 2002. pp. 69–102 (in Turkish). Koc A, Kocyigit A, Soran M, Demir N, Sevinc E, Erel O, Mil Z. High frequency of maternal vitamin B12 deficiency as an important cause of infantile vitamin B12 deficiency in Sanliurfa province of Turkey. Eur J Nutr 2006; 45: 291–297. Unay B, Ulas UH, Karaoglu B, Eroglu E, Akin R, Gokcay E. Visual and brainstem auditory evoked potentials in children with headache. Pediatr Int 2008; 50: 620–623. Markand ON. Brainstem auditory evoked potentials. J Clin Neurophysiol 1994; 11: 319–342. Stabler SP, Allen RH. Vitamin B12 deficiency as a worldwide problem. Annu Rev Nutr 2004; 24: 299–326. Misra UK, Kalita J, Das A. Vitamin B12 deficiency neurological syndromes: a clinical, MRI and electrodiagnostic study. Electromyo Clin Neur 2003; 43: 57–64. Caruso G, Santoro L, Perretti A, Massini R, Pelosi L, Crisci C, Ragno M, Campanella G, Filla A. Friedreich’s ataxia: electrophysiologic and histologic findings in patients and relatives. Muscle Nerve 1987; 10: 503–515. Rossini PM, Cracco JB. Somatosensory and potentials in neurodegenerative system disorders. Eur Neurol 1987; 26: 176–188. Mamlok RJ, Isenberg JN, Rassin DK, Norcross K, Tallan HH. A cobalamin metabolic defect with homocystinuria, methylmalonic aciduria and macrocytic anemia. Neuropediatrics 1986; 17: 94–99. Renault F, Verstichel P, Ploussard JP, Costil J. Neuropathy in two cobalamin-deficient breast-fed infants of vegetarian mothers. Muscle Nerve 1999; 22: 252–254. Casterline JE, Allen LH, Ruel MT. Vitamin B12 deficiency is very prevalent in lactating Guatemalan women and their infants at three months postpartum. J Nutr 1997; 127: 1966–1972. Specker BL, Black A, Allen L, Morrow F. Vitamin B12: low milk concentrations are related to low serum concentrations in vegetarian women and to methylmalonic aciduria in their infants. Am J Clin Nutr 1990; 52: 1073–1076. McCombe PA, McLeod JG. The peripheral neuropathy of vitamin B12 deficiency. J Neurol Sci 1984; 66: 117–126. Hay G, Clausen T, Whitelaw A, Trygg K, Johnston C, Henriksen T, Refsum H. Maternal folate and cobalamin status predicts vitamin status in newborns and 6-month-old infants. J Nutr 2010; 140: 557–564. Koç A, Koçyiğit A, Ulukanlıgil M, Demir N. Şanlıurfa yöresinde 9-12 yaş grubu çocuklarda B12 vitamini ve folik asit eksikliği sıklığı ile bağırsak solucanlarıyla ilişkisi. Çocuk Sağlığı Hastalıkları Dergisi 2005; 48: 308–315 (in Turkish). Guerra-Shinohara EM, Paiva AA, Rondo PH, Yamasaki K, Terzi CA, D’Almeida V. Relationship between total homocysteine and folate levels in pregnant women and their newborn babies according to maternal serum levels of vitamin B. BJOG-Int J Obstet Gy 2002; 109: 784–791. Kühne T, Bubl R, Baumgartner R. Maternal vegan diet causing a serious infantile neurological disorder due to vitamin B12 deficiency. Eur J Pediatr 1991; 150: 205–208. ISNAD DEMİR, NİHAT , KOÇ, AHMET , ABUHANDAN, MAHMUT , ÇALIK, MUSTAFA , İŞCAN, AKIN . "Visual and brainstem auditory evoked potentials in infants withsevere vitamin B12 deficiency". 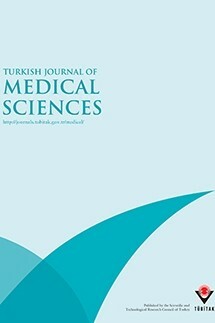 Turkish Journal of Medical Sciences 45 / 6 (December 2015): 1274-1279.